Aloha IBEW Local 1186 Members! The Super American Circus is in town and you will get a discount of the regular price of admission just for being a member of IBEW Local 1186! They will be in Kona from May 22-24th, Honolulu from March 29th-31st, Maui from April 5th-7th, and on Kaua’i from April 13-14th. Children are free ages 12 and under. General admission adult tickets for union members will be $24 each (regular price $38 if purchased through Ticketmaster), and Preferred Seating adult tickets are $28 ($42-46 if purchased through Ticketmaster). 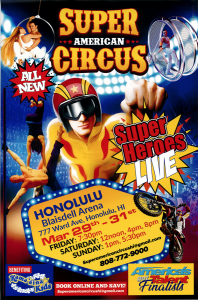 To purchase at this discounted rate, call Francisco Bledsoe at 808-772-9000 or email bledsoefrancisco@gmail.com and a Super American Circus Sales Team Member will process your sale.